HOUSTON (ICIS)--US January butadiene (BD) contracts reached a full settlement up 5.1% on rebalanced supply, sources confirmed on Tuesday. 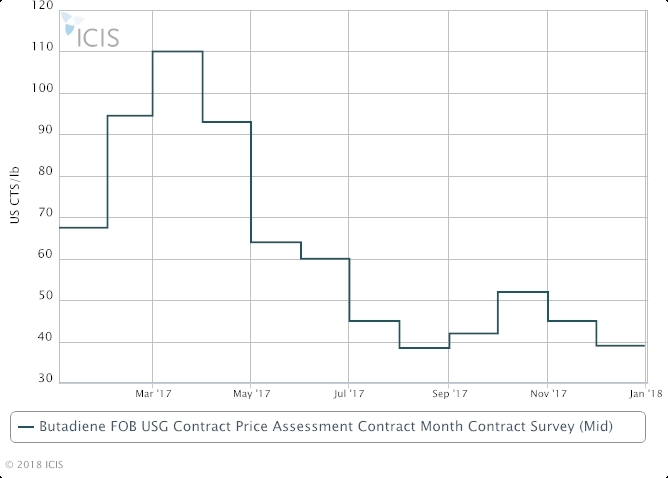 The 2 cent/lb ($44/tonne) increase puts contracts at 41 cents/lb on an FOB (free on board) basis. The first nomination for January was heard for a 3 cent/lb increase, but all following nominations were heard for separate increases of 2 cents/lb. Butadiene (BD) is a raw material used in the production of tyres. Sources said the increases were mostly driven by rebalanced supply following several major export deals into Asia. Those deals were heard to be done in the upper 30s cents/lb on a CIF (cost, insurance and freight) basis, in line with December BD contracts. Demand in January is expected to improve on the easing of inventory control measures and strengthening demand from Asia. Supply is expected to remain balanced, but sources said it is more likely to lengthen than tighten giving ongoing cracker construction and expansion activities.